The Cheeseburger In Paradise restaurants in Exton and Langhorne, Pennsylvania and in Newark, Delaware will be participating in the Gluten Intolerance Group's Chef to Plate National Awareness Campaign beginning May 1. The GIG has launched a national awareness campaign for gluten-free living through restaurants that offer support to people with celiac disease. The program runs throughout May, which is International Celiac Disease Awareness Month. Cheeseburger's gluten-free menu ranges from appetizers and salads to island specialties. Items include bunless chicken sandwiches and hamburgers, ribs, and salmon and chicken entrees. The french fries are cooked in a dedicated fryer. UPDATE (7/16/09): Starbucks has decided to discontinue its recently introduced gluten-free orange cake. According to a tweet posted Wednesday on its Twitter feed, the company is doing so because it "heard [from customers] that it was too much of a treat, and not a nutritious snack." KIND Fruit + Nut bars will replace the cakes as a gluten-free offering. Keep on the look out for it in the pastry case with a sign that says “gluten-free.” A single cake will be displayed unwrapped so you can see it clearly, but don’t worry. They all come individually packaged to prevent cross contamination. And with the ingredient list right on the package, it’s easy to see exactly what you are eating. Kudos to Starbucks for responding to their customers. Hopefully this will be the first of many gluten-free food options available there. Three hard-to-find gluten-free foods are part of Gluten Free Philly’s first product giveaway, which I announced on Tuesday. All you have to do is visit the site and sign up for an email subscription. If you already subscribe, just drop me a line telling me that you are interested in the giveaway. The deadline is Tuesday, April 21, 2009. I also wrote this week about new gluten-free frozen entrees that provide alternatives to the many meals from Lean Cuisine and Healthy Choice that contain prohibited ingredients. Earlier this month, I wrote about Van’s new gluten-free pancakes and cinnamon French toast sticks. It turns out that the products contained barley malt extract as an ingredient. I wrote to and called the company asking about this, and initially Van’s responded that the amount of gluten in the products was less than the FDA-proposed limit. After considering consumers’ concerns, the company has decided to remove the malt extract as of the next production run. If you find these products at your local market or health food store, check the labels to see if the foods have been reformulated. I now have more than 70 area eateries, representing a variety of cuisines, listed on my post of gluten-free friendly restaurants. Many of the establishments have dedicated gluten-free menus, links to which are posted alongside the corresponding restaurant’s name. Let me know if you’re aware of any other restaurants that have separate menus. As a reminder, the National Foundation for Celiac Awareness April Meet-Up will take place at one of those restaurants, Little Fish in South Philadelphia, on Monday, April 20, 2009 beginning at 6:30 p.m. Reservations are being accepted through the NFCA website. Speaking of Little Fish, chef Mike Stollenwerk will be participating tonight (April 16, 2009) in a gluten-free cooking event sponsored by Drexel University’s Academic Bistro. The event will take place at the Academic Bistro, located on the 6th floor of the Academic Building at 33rd and Arch streets in Philadelphia, from 6:30 p.m. to 8:30 p.m. Tickets can be purchased at the door for $35. Stay tuned for an announcement about a celiac awareness dining event, sponsored by several area restaurants, that will take place in early June. I also will be posting soon about my recent visit to the new Naked Chocolate Café near Rittenhouse Square in Philadelphia. UPDATE (4/22/09): Congratulations to readers Sonnie and Jodi, winners of the giveaway prizes. Last month I mentioned that I found gluten-free chow mein noodles that were available for the Passover holiday. Although many area supermarkets carried the basic Passover staples, the noodles were not widely available. So I figured I would include them in Gluten Free Philly's first gluten-free product giveaway. Two lucky readers will each win one package of Paskesz medium-size chow mein noodles, one package of six Paskesz chocolate cupcakes, and one box of Lieber's Confetti Cookies. All you have to do is sign up for (and confirm by) Tuesday, April 21, 2009 an email subscription to Gluten Free Philly through the "Subscribe via email" form in the lower right-hand section of any page on the site. (Here are all the rules: (1) one email address per household, please; and (2) United States residents only. Email addresses are used only for subscriptions and are not sold or distributed to third parties.) If you currently subscribe by email, just drop me a line at gfphilly[at]gmail[dot]com by that date telling me that you want to be in the running for the goodies. I will randomly select two email addresses on Wednesday, April 22, 2009, and the winners will be contacted via email and announced in a future post. Good luck! Most varieties of popular frozen entrees such as Healthy Choice and Lean Cuisine contain wheat, making it more difficult for celiacs to prepare a quick, convenient meal. However, there are companies offering some gluten-free alternatives. 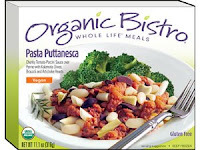 The newest brand available is the line of Organic Bistro Whole Life meals, sold at area Whole Foods markets and through online ordering. The company makes eight organic, fiber-rich "to-go" meals, including Pasta Puttanesca, Jamaican Shrimp Cakes and Chicken Citron. At Whole Foods, the entrees are priced at $6.49 each. Organic Bistro's home-delivery service, which ships the products in a reusable, insulated cooler packed with dry ice, currently has an introductory price of $30 for six entrees ($5 each). The standard home delivery charge to the Philadelphia area is about $10; second-day express delivery is about $21. 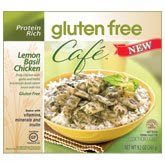 Hain Celestial, which makes DeBoles gluten-free pasta and Arrowhead Mills gluten-free baking mixes, sells all-natural frozen entrees under its Gluten Free Café label. There are four varieties: Fettuccini Alfredo, Asian Noodles, Lemon Basil Chicken and Pasta Primavera. The entire line is gluten-free certified by the Gluten-Free Certification Organization, a program of the Gluten Intolerance Group. Whole Foods also carries these meals, priced at $4.99 each. Glutino's microwaveable entrees, including Chicken Ranchero and Pad Thai, can be found at local Wegmans stores as well as at Whole Foods. UPDATE (4/9/09): Casona has updated the adult and children's menus on its website to note items that are gluten-free. Casona is a lovely Cuban/Latin BYOB in Collingswood, New Jersey where we've dined on several occasions since the restaurant opened in 2006. Prompted by an article in this month's South Jersey magazine mentioning that many of Casona's desserts are safe for celiacs, we paid another visit over the weekend. Owner Mark Infantado presented us with a designated menu that listed more than half of the items, from appetizers to entrees to sides, as gluten-free. This time we skipped our favorite starter, the nacho-style mariquitas (fried plaintain slices topped with marinated pork, ground sirloin and swiss cheese), so that we could share the delicious lechon asado (citrus-marinated pork) and the ropa vieja (flank steak). On the children's menu, the Casona burger (without the bun) and the citrus pork are gluten-free. Notably, the restaurant uses a dedicated gluten-free fryer for its plantain chips, tasty yucca fries and french fries. All of Casona's desserts except for the tres leches cake are gluten-free. We tried the key lime pie and the chocolate cheesecake, both of which were excellent. Other options include carrot cake and several varieties of flan. UPDATE (4/15/09): Given the many concerns expressed by customers, Van's will be removing the barley malt extract as an ingredient in the pancakes and french toast sticks with its next production. We recently launched two new Wheat Free products — Van’s Wheat Free Cinnamon French Toast Sticks and Van’s Wheat Free Homestyle Pancakes. Like our Wheat Free Waffles, these new products are gluten, dairy and egg free. We have received some inquires regarding the use of malt extract in our new Wheat Free Homestyle Pancakes and Wheat Free Cinnamon French Toast Sticks. All of Van’s wheat free products comply with the definition of “gluten free” proposed by the FDA which states that to be considered gluten free a product or its ingredients must not contain more than 20 ppm of gluten. While the malt extract used in these two products is derived from barley, it is tested and meets the gluten free standard as the gluten protein found in the barley is removed during the malt extraction process. The barley is processed though many steps including steeping, germination, drying, grinding, mashing and evaporation. All these stages remove gluten from the barley. In addition, malt extract is used at very low levels in both products. Van’s Wheat Free Cinnamon French Toast Sticks contain less than 1% of malt extract and Van’s Wheat Free Homestyle Pancakes contain less than 2% of malt extract. As part of our manufacturing process, we test incoming raw materials and our finished wheat free products for gluten to ensure that the raw materials and finished products meet or exceed the proposed gluten free standard. We understand the concern regarding the use of malt extract in gluten free products want to assure you that these new products meet the same standards as all other Van’s Wheat Free products. UPDATE (4/6/09): I spoke today with a Van's customer service representative, who advised that the malt extract in the pancakes and french toast sticks is derived from barley but that the gluten is removed during processing. She told me that the ingredients are tested at various intervals during production and that any gluten present in the end product would be less than 20 parts per million (ppm), which would be within the proposed FDA requirement. Given this information, consumption of the Van's products is a matter of one's own comfort level. UPDATE (4/5/09): Reader Amy pointed out that although both of the Van's products are labeled "gluten free," the ingredient label lists malt extract. (Both products also are listed as "gluten free" on the Van's website.) I will further update this post after I hear back from the company. Two new "Wafflewich" breakfast sandwiches are among the new gluten-free products recently introduced by Ian's Natural Foods. The company, which was first to market gluten-free french toast sticks and kids' meals, will be rolling out microwaveable sandwiches that stack egg patties with either maple-infused cheddar cheese or maple-flavored sausage on gluten-free waffles. In addition to the breakfast items, Ian's also has created two new gluten-free snack bars that come in apple pie and cinnamon bun flavors, made with brown rice cereal and topped with yogurt. Meanwhile, Van's Natural Foods has two new breakfast items of its own that are labeled gluten-free. The pancakes and cinnamon french toast sticks are made from whole-grain brown rice flour. Ian's and Van's products can be found locally at Whole Foods, Wegmans, and many health-food stores. I found both sandwiches as well as the pancakes at Whole Foods in Marlton, New Jersey. If your local store is not yet carrying the new items, ask the manager or owner to order them.